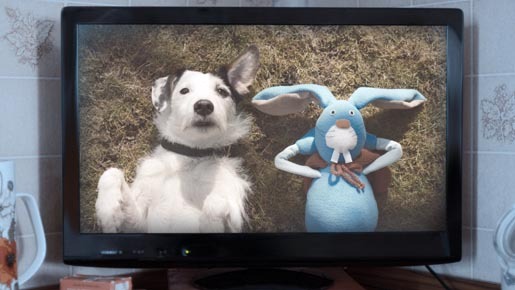 Thinkbox has launched “Harvey and Rabbit”, a new television advertising campaign reminding advertisers of the continuing power and effectiveness of TV as a medium. Harvey the dog starred in Thinkbox’s previous TV ad, “Dogs Home”, uses emotional story-telling to change his owner’s behaviour dramatically and persuade him not to throw away his best friend and constant companion, a stuffed toy called Rabbit. Harvey and Rabbit opens at the moment that Harvey’s owner (Robert Whitelock) is about to put the well-worn, slobber-covered Rabbit in the bin while Harvey is apparently not around. Harvey suddenly appears and plays a TV ad telling the story of how he and Rabbit became friends and the scrapes they’ve got into together over the years. Harvey’s ad persuades his owner to let him keep Rabbit. The ad then ends with the line ‘Discover the power of TV advertising at www.thinkbox.tv’. “Harvey and Rabbit” is the third TV advertising campaign Thinkbox has launched. The first, in 2009, was awarded by D&AD, the BTAAs, and the APA, and helped Thinkbox win the Best B2B Marketing award at the Marketing Society Awards for Excellence. The most recent, “Dogs Home” featuring Harvey, launched in 2010 and was voted by the public as 2010’s Ad of the Year for ITV1. Harvey was also named celebrity dog of the year by Dogs Trust. Harvey and Rabbit was developed at The Red Brick Road, London, by creatives Mark Slack and Gemma Phillips, executive creative director Paul Weinberger, account directors Lisa Pilbeam and Ebony Moore, account manager James Rowe, agency planner David Hackworthy and agency producer Miles Nathan. Filming was shot by director Si & Ad via Academy Films with producer Lucy Gossage and director of photography Marcel Zyskind. Editor was Sam Rice-Edwards at The Assembly Rooms. Post production was done at Finish. Music, “Friends” was written and perfomed by Adam Buxton and composed by Nick Webb. Audio post production was done at Scramble. Media was handled by Mediacom by planners Andrew Lloyd and David Mills. Who Looks at Banner Ads?